Posted May 23, 2016 by Charlie & filed under Uncategorized. Hello everyone. I have been pretty terrible about updates to this blog site. So I am going to try and make an effort to post more often with more content. For instance I want to talk about the big thing that happened to me this week which was my trip to Anime Central in Chicago. While there I made some purchases, saw some great cosplays, and generally had a good time. It was very crowded though and I had one hell of a time navigating the convention floor. To make up for that though the lines to buy the tickets for the convention where streamlined immensely, taking only 15 minutes to get through and to register. Included with this post should be a photo of some of the stuff that I purchased while there (due to my only having limited funds at the moment) but I really like what I purchased. And that is about all I want to say. I wish I had more and I will make an effort to talk about what is on my mind on this site more often. Thank you for reading, and I hope you have an amazing day. 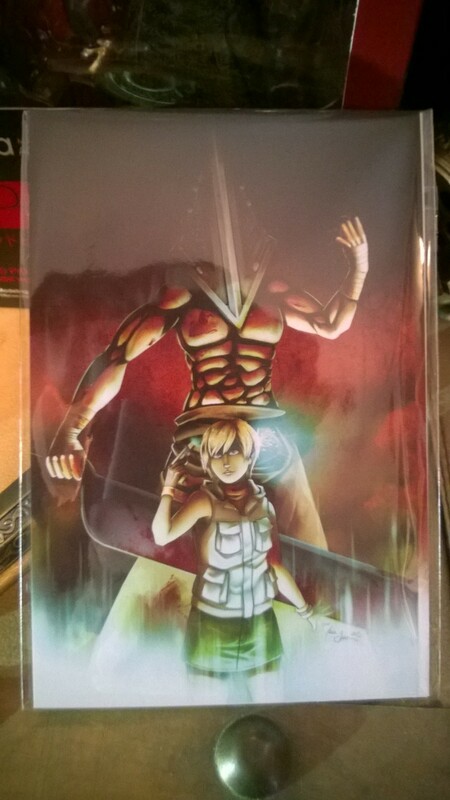 A wonderful piece of fan art I bought while at Acen. Posted June 23, 2013 by Charlie & filed under Uncategorized. No, this isn’t going to be a thing that I will do often, but I just wanted to give my two cents on the film since I have a lot to talk about. First off, to give it a short summary is was a okay film. It had a lot of good elements but nothing brought to their full potential and most of them wasted. Visually it was stunning, and the fights and effects look gorgeous. And all of the actors did a good job with their roles, especially our leads and our main villain. But this film has many flaws. It feels like there is too much going on, and often times feels cluttered and confused. It also has a very grim atmosphere, which to me isn’t Superman. 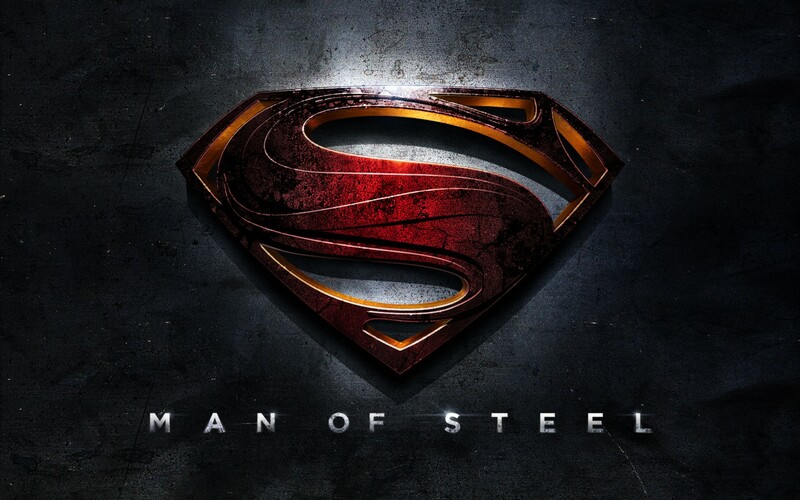 Yes, I know this isn’t supposed to be like most Superman movies, but the tone, the look, and the acting makes the film feel dark and depressing for a character that is supposed to be fun and the ultimate form of wish fulfillment. And while the villain is good, Zod seems like far too big a bad guy to put right at the start of reinventing Superman, since one of his key points is that he is the last son of Krypton and that there is nobody else like him out there. In fact an idea of what they could have done is instead made three stories to build the Superman universe. First would be a film on the fall of Krypton, building the culture, the tragedy, the motivations of Jor-El and of Zod, and building other elements like maybe future villains like Brainiac or Doomsday (yes, comic book continuity says they don’t exist on Krypton, but that could change). 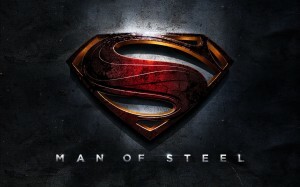 The second film would be Superman finding his place as a hero, coming to terms with his responsibility and deciding what he can and can’t do. Here he could fight somebody like Metallo or Toyman, a human villain who Superman has to face in order for him to see the worst of humanity and also see just how easy it is to start abusing your power.Finally you can have the third film, with the arrival of Zod and him having to come to terms with the legacy of his people and finally chose which side he needs to chose to fight for, as well as showing that he has to give up being with his own people in order to be Earth’s protector. Besides that, I want to say that this film didn’t feel bad, just felt like it had potential that it just couldn’t carry through. In fact that brings up a point that I do want to discuss about this films ending. SPOILERS BEYOND THIS POINT MY FRIENDS, LEAVE NOW IF YOU WANT TO BE SURPRISED AT THE END! Alright, throughout the movie there was a minor theme of “the greater good.” Jor-El’s plan to send Kal-El to Earth was to help his son, but he had to stay for the greater good, since he is a product of Krypton’s culture, which he felt had rotted by this point and was destroying itself, and if he went with him then his son would grow up Kryptonian with morals similar to the ones that got their planet destroyed. Zod other throwing the government of Krypton was for the greater good, putting somebody in charge who would be able to save their planet. Clark Kent’s dad allowed himself to die by twister in order for his son to keep his identity safe. The generals decide to hand Superman to Zod in for the greater good of Earth. And in the end, Superman had to kill Zod, for the greater good of every Earthling, since if Zod continued to live, he would not stop destroying lives. This motif could have been a very interesting one to examine and talk about, but it is wasted and it feels like it could have been a huge part of the movie when it was reduced to a minor idea. If this point had been hammered into us if the words had been spoken out loud many times, this would have been an epic part of the film, but it was misused and is now just a good idea that wasn’t able to work under the script it was given. So again, okay, had the potential to be better, I would rent it when it comes out to avoid spending 20 bucks on popcorn. Thanks for reading. Posted May 14, 2013 by Charlie & filed under School News. Oh thank everything that is good and decent they are over. I still have stuff to do, even at home, but the fact that I don’t have to worry about tests and assignments for the whole summer is a relief. This semester was really rough, and even now I still feel like I got my a$$ kicked. 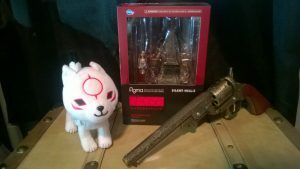 But it is behind me, and for now I will be focused on other things, including trying to make these blog posts regular because I feel like it. Also, I would like to note that I by regular posts I mean posts as often as I can when I have something to talk about that hasn’t been talke about to death already by far more popular and competent guys then me. Posted May 9, 2013 by Charlie & filed under School News. I don’t know, but I am going to try. Good luck to everyone else in my position! I will post again if I survive this week. Posted May 1, 2013 by Charlie & filed under Uncategorized. So yeah, if anybody who knows me has been following my blog and has been wondering why the hell are all of my blog posts about technology stuff or programing and not about anything else it isn’t because I am a technology nut or a programer, it is because they were mandatory for a class (that is why almost every one is about 300 words long and have about as much resources or sources on the subject of an average post on Facebook). So now that IM 365 is basically over and the year is winding to a close I want to actually start using this blog to, surprisingly, blog. Topics can range from mundane little things that get on my nerves, to discussions on beliefs and ideas that I have about the real and fictional world, and probably a list or two on things I love or hate. I don’t know how this will turn out in the end, and believe me I would love to say that I am going to actually use this blog to its fullest potential, but I due to time issues and such it is never that easy to do so. Posted April 30, 2013 by Charlie & filed under IM 365. I don’t really have any concrete plans of exactly where I am going right after I graduate (cut me some slack I am a sophomore) but I do know what I want to get into. First thing I will probably get is a basic technology job, something that doesn’t pay too well but enough to keep me fed and have a roof over my head. It will also probably be a programing job, so that is a fun job for somebody who deliberately choose a path that avoided just programing. I can also do some freelance work on the side, though I don’t know anything about freelance work for animators and I suspect that it will be the only animation job I will have for a while after I graduate.. I will used this time as well to help work on my skills in animation and help improve my portfolio sos that I am more desirable for larger companies. And this would be around the time where I start to figure out what it is really like to live on my own. Posted April 23, 2013 by Charlie & filed under IM 365. As I stated in the last blog I am not a big fan of smart phones or iPads, so I might have some bias here. But I don’t think they are going to replace personal computers and laptops. First of all, keyboards are still preferable to touch screens for a lot of people. I know that a lot of people, including me, usually prefer to touch a physical button, and feel the pressure of them versus to using a touch screen that feels far less satisfying when you press the button. And also when it comes to typing so many would prefer to use a keyboard rather than the touch screens. Posted April 18, 2013 by Charlie & filed under IM 365. The IM 365 I found the most fun was the CSS Zen Garden project. Having to work with HTML code we didn’t code ourselves really made an interesting challenge, and it also allowed me to focus solely on the CSS and how it looked. And the HTML was coded well so that while I was working the patterns and boxes formed naturally due to the html. There were issues, like I couldn’t get the outside font to work and after a while I just given up on it, and the opacity stumped me for a bit, but I just found the project fun and interesting. I liked the challenge, the ability to design without worrying about content, and the fact that the design I made looked good in my opinion. I am proud of this assignment and I had a lot of fun programing for it, and while it isn’t the biggest success for this class it is one that I felt showed what I could do with CSS. Posted April 16, 2013 by Charlie & filed under IM 365. I don’t really have that much of an opinion of iPhones because I don’t use them, or any smartphone for that matter. I don’t really care about smart phones either, since i am a bit of simplistic person who prefers my phone to make phone calls and not do everything that could be done with a computer on a smallers scale. So everything I am saying from this point onward is an outsider looking at the situation and is not sure what is going to happen in the industry. And I am also talking as a person who doesn’t care about smartphones to begin with, so please understand that with my new opinion. Posted April 9, 2013 by Charlie & filed under IM 365. CSS3 is a feature that I like because the ability to add extra style to my page. Small things like the animations and shadows actually make a big difference because they turn a rather boring page into something that looks much more detailed and interesting even though it is only minor modifications. I especially like the shadows, since they make a lot of bland pages pop with more vibrant life to them. I also think that other small things such as tilting and rotating text could be very useful later on because as I have learned with typography emphasis is very important and tilting something is a good way to bring emphasis.